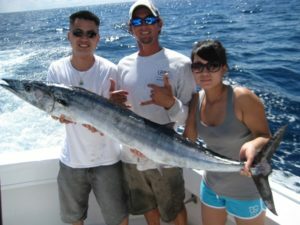 The Wahoo is a great game fish that is available to our Ft Lauderdale fishing charters on an almost year round basis. We catch these speedsters every month of the year, and by virtually any method of presentation. 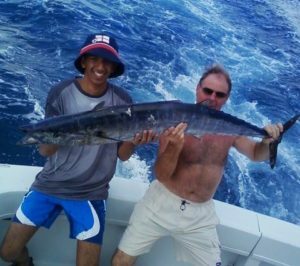 In January, February and March we catch most of our Wahoo by live baiting. The majority of live bait taken Wahoo are caught on baits suspended from a fishing kite. Our favorite kite fished live baits are Goggle Eyes ( a Skad), Tinker Mackerel, Blue runners (Jack family), and Threadfin Herring. Lots of Wahoos are incidental catches while targeting Sailfish. We’ll take incidental Wahoo any time. 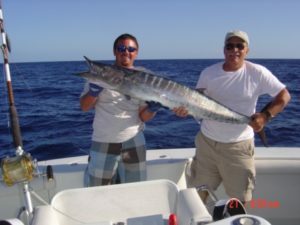 April, May and June yield good numbers of Wahoo also, but remember the Wahoo is hardly ever caught in large numbers. Most of the Wahoo caught while fishing the Fort Lauderdale area during these months are taken by trolled baits. While frequently hooked on “surface” trolled baits, by far the most productive method involves getting the bait below the surface by at least 2 to 3 feet. We often fish them much deeper. Wire lines with or without torpedo (shaped) leads or braided lines and the use of “planers” will draw wicked strikes. An oversized Ballyhoo (aka Horse Ballyoo) or an extra long Bonito strip bait cut from the belly of a freshly caught Bonito is a good choice. The remaining six months of the year yield some really nice Wahoos, but August and September are our favorite months for big “Hoos”. Large numbers of Bonito are in the area then and while a fat Bonito isn’t great table fare to you or me, they are fillet mignon to any Wahoo, large or small. No live bait is more difficult to keep healthy in a bait well than a frisky Bonito. They require a round well as they swim At SPEED constantly and a hard corner or even an oval turn in a bait well will be lights out. Circular wells get the job done. Our man bait well aboard Marlin My Darlin is 46” across-takes up a lot of space-and it was built that big with one little baitfish species in mind. The “Bullett Bonito”. The “Bullett” nickname comes from their speed. We can hold about a dozen of them in that well as opposed to 60 or more Goggle Eyes in the same container. A nose hook and a trailer “stinger” hook and a short piece of wire and you are in business. After the hook-up expect a couple or three strong blistering runs coupled with quick changes in direction and your Wahoo will be boat side. Still capable of a burst of speed we bring these fish to gaff often at an increased RPM on our side of the fight to match the Wahoos affinity for one last boat side run. A couple of trademark headshakes and it’s over. Two gaffs are best on the larger fish as you will have much better control of the fish as you swing him aboard and then steer him into the fish box. It might seem like overkill, but with that mouthful of teeth many a Wahoo has drawn some very serious blood, and many a careless or unfortunate angler has been on the receiving end of some severe and serious wounds.